Dr. Lee and I started working on Authentic English Readings for Advanced Students because we have students who can benefit from studying what native speakers write for each other. This text will retail for 13,000 Korean won and should be fairly easy to find in South Korea as Hyung-Seul Publishing is one of the country's oldest educational publishing companies. If you live outside South Korea the book will eventually be on Amazon or if you need to place a sizable order (say for every student in a class you're teaching or something like that) I'll work with you directly to see if we can get you the books. 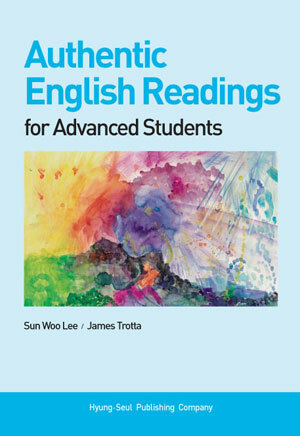 My email is jtrotta@gmail.com and I'm happy to send you a sample chapter or answer any questions you may have about Authentic English Readings for Advanced Students.